Flat roof constructions can either be insulated as warm or cold, the difference being in where the insulation material is placed. 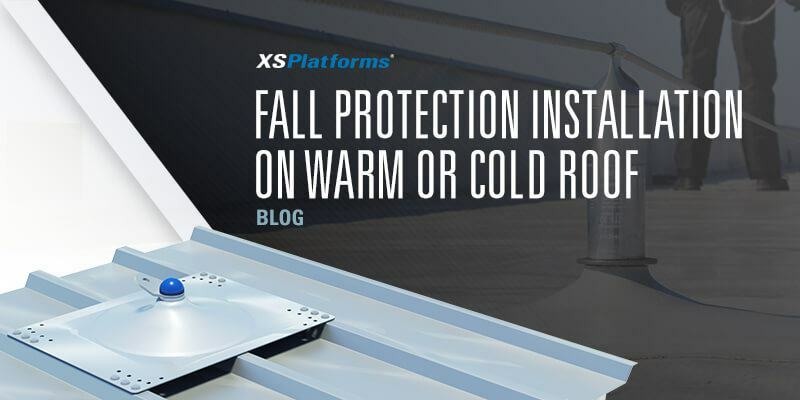 As most fall protection anchor points are installed on the roof surface it is important to note the differences between warm and cold roof constructions. The main difference between both roof types is the location of the insulation with respect to the joists. In a cold roof construction the insulation can be found between the joists, beneath the roof deck. A warm roof construction, on the other hand, has insulation installed on top of the roof deck, covered by a waterproofing membrane. 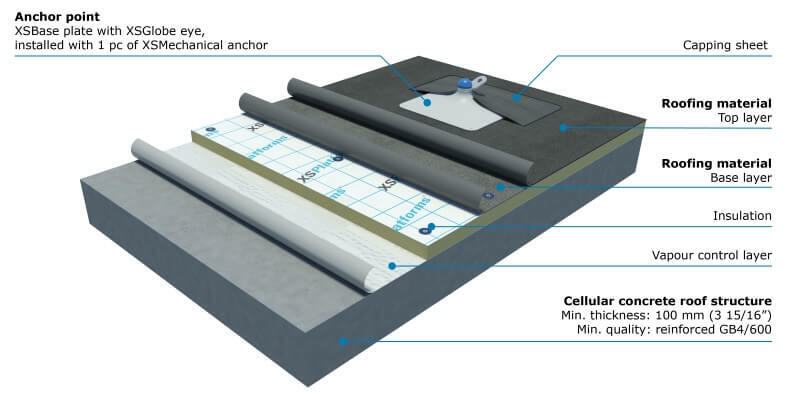 When installing fall protection on a warm roof construction the layer of insulation and waterproofing membrane have to be penetrated, which will result in a thermal bridge and might even cause leakage. For a cold roof construction the risk of a leak also exists, after all the roof material is being pierced in order to install a fall protection system. A thermal bridge, or cold bridge, is a ”weak” spot in the insulation where warmth can leak to the outside. This can lead to higher costs for heating the building. As the thermal bridge is the coldest part on the inside of the roof, a side effect can be local condensation. This can cause corrosion and rotting of the surrounding materials, resulting in higher costs for maintenance. At XSPlatforms we are aware of the thermal bridge effect and have done everything to prevent this side effect. As a result we have developed our XSBase plate, which only requires one drilling hole, reducing the amount of thermal bridges compared with other anchors. Installing permanent anchor points on both cold as well as warm roof constructions often requires drilling holes in the structure. When the anchor point is not finished or installed correctly this could result in leaks. This is something no building owner wants as leaks cannot only damage the structure they could also cause damage to (electrical) equipment, which is located inside the building. This is, of course, something we have extensively thought about as a manufacturer. Our headquarters is situated in the Netherlands, a country where heavy rainfall is rather common, so we do everything we can to ensure our anchor points have a watertight connection. As there are differences between the types of roofs we have developed three different base plates to cover the most common types. Our XSBase plate, is mostly used for warm roof constructions, such as concrete and deep deck structures. The XSBase plate is installed with one of our special fixation anchors, which include one Ø 70 mm and 25 mm rubber pinch rings that are placed respectively between the roof and the base plate and between the base plate and the attachment. Additionally all attachments, such as a single anchor point or an anchor post for a horizontal lifeline system, include a rubber ring that ensures that the connection does not let any water through either. To finish the installation a roofer shall cover the base plate with a capping sheet. 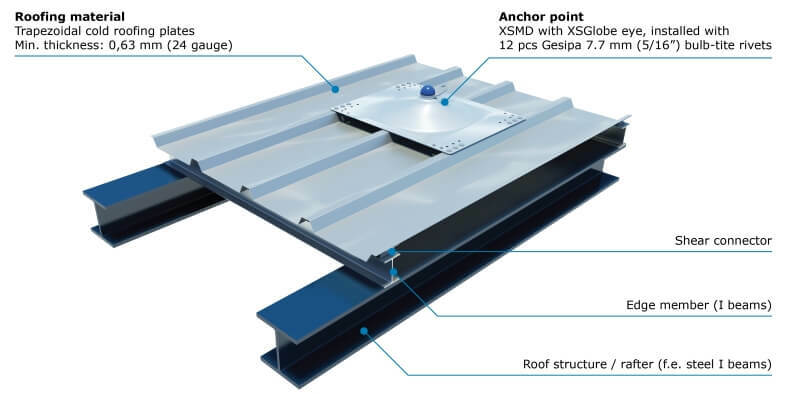 The XSMD 400 and 500 base plates are used for installation on trapezoidal cold roofing and sandwich panels. This system is installed with Ø 7 mm rivets, which ensure a waterproof connection. Full penetration of the roofing material, insulation or structure is not necessary for this installation, eliminating the risk of a leak. The XTrusion base plate is used for installation on standing seam roofs. The installation of this base plate bring no risk of leakage because there is no penetration of the roofing materials necessary. The XTrusion base plate, specially designed for these types of roof, is mounted to the seams by means of four individual clamps per base plate.